A tree fell … did you hear? Is it true that if a tree falls in a forest and no one is around to hear, it makes no sound … even if it’s a really big tree? 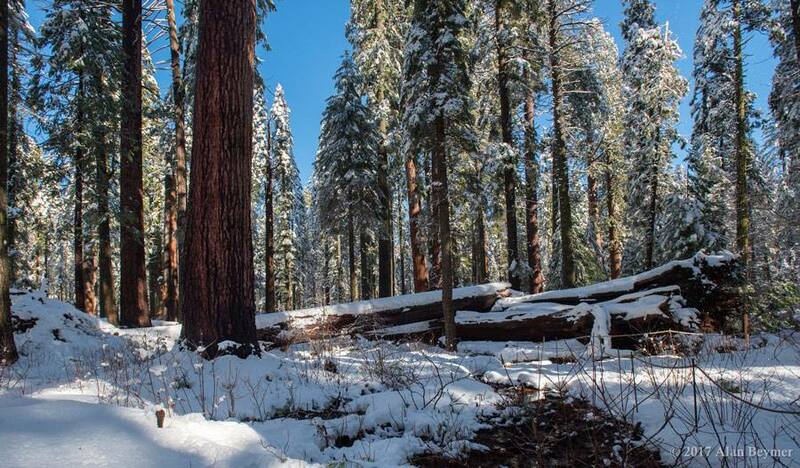 Above, fallen giant sequoia, Alan Beymer photo (source). 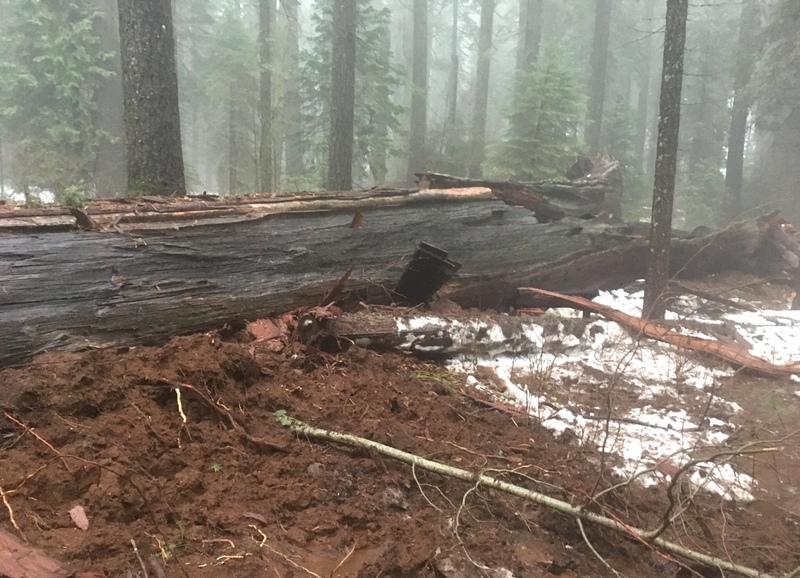 In early January, a huge tree fell in a forest. No one was around to hear it, but multitudes heard about it. 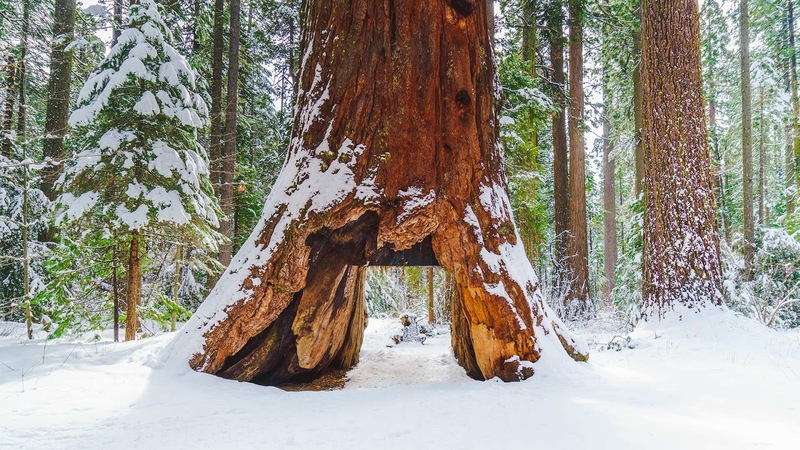 On January 9, the New York Times announced: “Giant Sequoia ‘Tunnel Tree’ in California Is Toppled by Storm” and devoted ten inches to its life and demise. National Geographic paid tribute, noting that the tunnel may have been a contributing factor. The Los Angeles Times called the tree iconic, and mourned the loss of “one of Calaveras County's oldest residents.” A week later, the sad news showed up in The New Yorker, in a soul-searching article by Nathan Heller, in the Culture section. “I want, instead of honoring the tree directly, to conjure up the world in which it was a monument for me” (source). “Pioneer’s Cabin, Calaveras Grove, Calif., U. S. A.” 1899 (source). 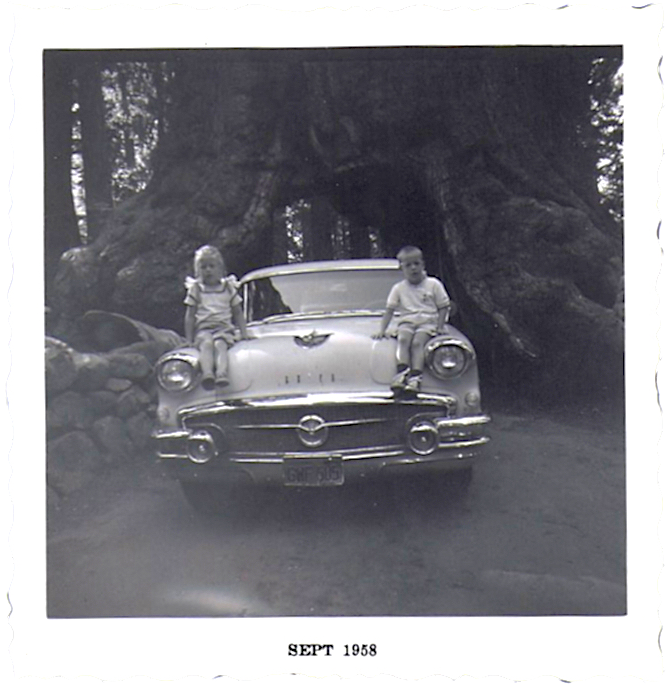 Pioneer Cabin Tree in 1952; click on image to view park ranger (source). Pioneer Cabin Tree, January 2017 (source). A severe storm saturated the soil around it, probably weakening the already-decaying trunk and roots. Why did a fallen tree get so much coverage? Because just about everyone still alive who ever drove through a giant tree clicked on a news link hoping it wasn’t that tree … and thereby triggered more articles. I’m sure of it, as that’s what I did. 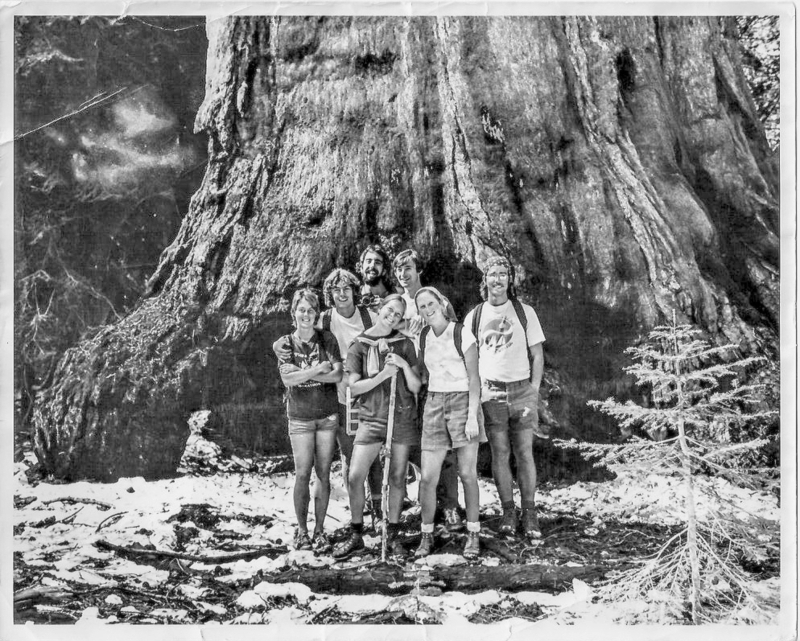 It’s been 40 years since I left California, land of giant sequoias, but whenever I see photos, memories quickly surface. There are vivid memories of walking on winding trails through aromatic forests, identifying incense cedars, sugar pines, white firs, big-cone Douglas firs and other majestic conifers framed by narrow shafts of light. Then, suddenly, a monster appears!—a tree huge beyond imagining, dwarfing all others. We stand with heads bent back, searching for the top. We inspect the thick furrowed bark, and scan the ground for cones and seedlings. One of us has brought a camera, so we join at the base and that kind soul pushes the button, immortalizing the moment. 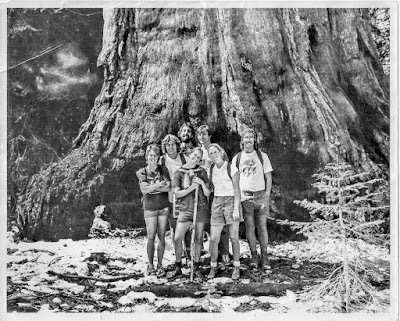 Young field botanists in California’s Sierra Nevada. Then there are dimmer memories—of talks and walks led by my heroes, park rangers. No photos survive. Or maybe none were taken; my parents were frugal with film. 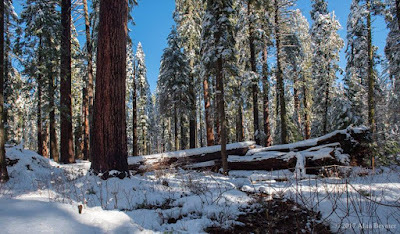 But I clearly remember what the rangers told us about sequoias, about their thick fire-resistant bark and absurdly tiny cones with minuscule seeds—such improbable beginnings for ancient giants. “The seed that grew into this tree sprouted during the Revolutionary War!” “This tree was already 500 years old when the Roman Empire fell!” Etc. 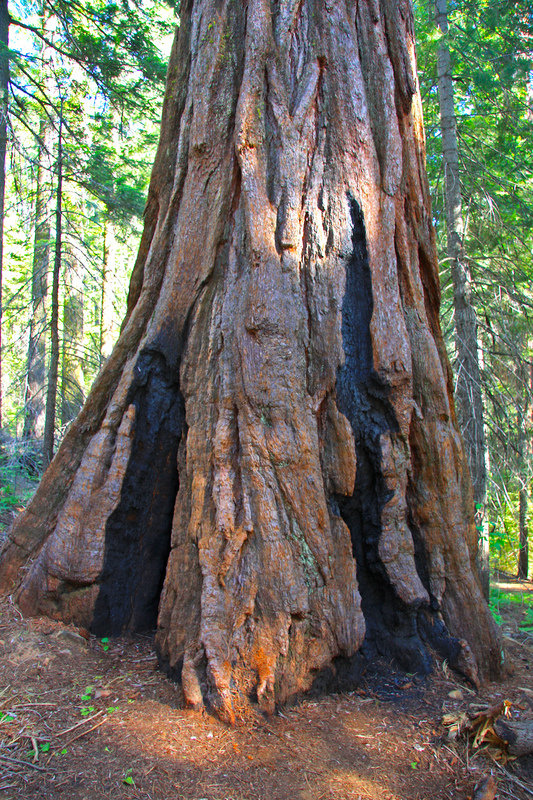 Sequoia bark can be up to three feet thick at the base of the tree (source). Sequoiadendron giganteum cones and seed (source). Is this memory real? That was so long ago! Or did the photograph save the moment for me? If so, I’m grateful. 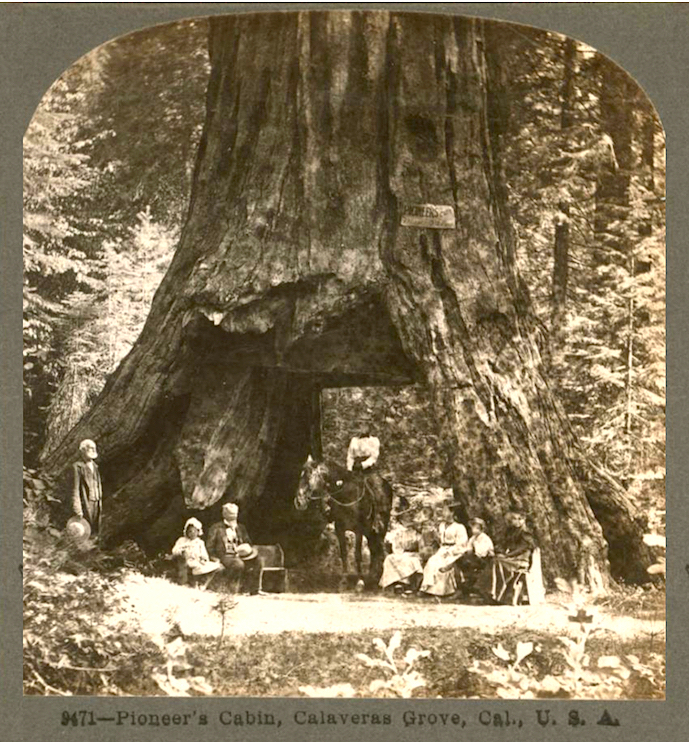 *We called the trees giant redwoods. They’re actually giant sequoias, Sequoiadendron giganteum. Redwoods are Sequoia sempervirens; they grow in the coast ranges of northern California and southernmost Oregon. 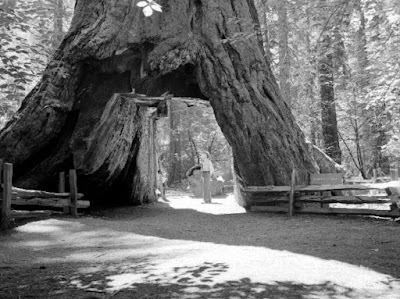 **When I compared news photos to mine, I saw that the recently fallen sequoia was not the one we drove through long ago. That was the Wawona Tree in Yosemite National Park. It too fell, in 1969, probably for the same reasons. Steno concluded that shell-like “bodies” in rock looked like shells because … they once were shells! This seems like a no-brainer today, but in the 1660s it was a profound realization. Marine bodies did grow in the rock, as many thought. Rather they were creatures that lived, died and were buried in sand and mud on the bottom of an ocean. 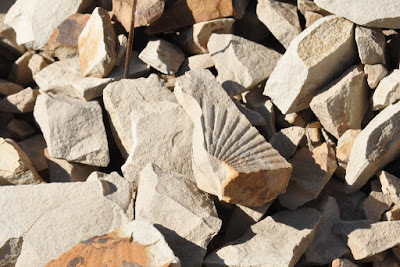 Then disturbance moved the Earth, seas became dry land, muck turned to rock, and seashells ended up in high in the mountains far from the shore. 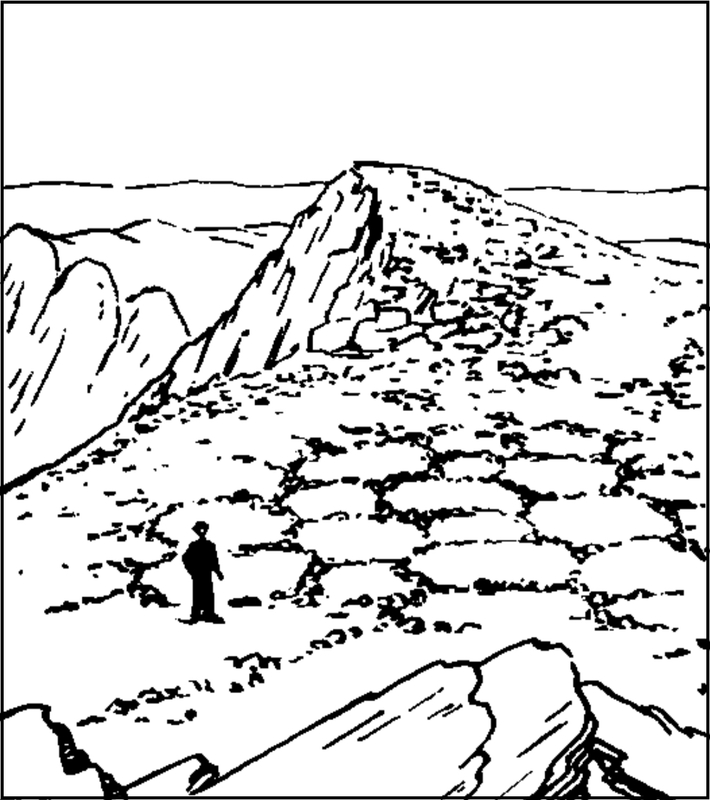 “Geology assuredly does not reveal any such finely graduated organic chain; and this, perhaps, is the most obvious and gravest objection which can be urged against my theory. The explanation lies, as I believe, in the extreme imperfection of the geological [fossil] record.” On the Origin of Species, 1859. Not long after Darwin published On the Origin of Species, access to the fossil record grew dramatically. Pioneering paleontologists excavated thousands of fossils, taking them back to their respective institutions. The pace accelerated through the twentieth century and continues today. Even so, fossils remain rare. Though zillions of creatures have come and gone during the 3.65 billion years since life began, precious few died where they or their parts could be preserved. Most decayed. I’ve read that only 1% of all organisms that ever lived have been fossilized, though I wonder … how can we know? There are spectacular exceptions, sites where fossils number in the millions. These are lagerstätte, meaning “storage places.” German miners use the term for rich seams of ore—mother lodes in English. There are two kinds of fossil mother lodes. In concentration lagerstätten, fossils are exceptionally abundant, but are mainly disarticulated bones or fragments that aren’t always useful in reconstructing organisms. 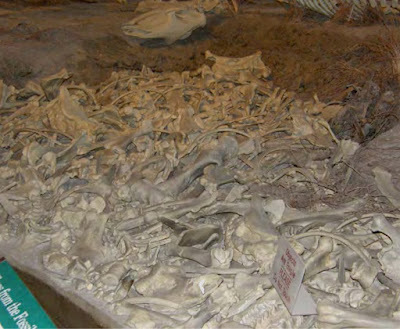 Above, bones from a dried-up waterhole, during a severe drought circa 20 million years ago. Below, reconstructed Dinohyus (Agate Fossil Beds National Monument Visitor Center). Most highly prized are conservation lagerstätten, where fate stepped in to preserve quality as well as quantity. Fossils include articulated (connected) skeletons, soft tissues of various kinds, even entire organisms (e.g., flies in amber). Soft tissue fossils can be quite beautiful, with minute details of hair, feathers, muscle tissue, even ovaries with eggs! And soft tissue preservation immortalizes organisms that have no bones or shells, such as insects, spiders and plants. Above, Jack hunts for sea scorpions (Eurypterus) that swam the seas 400+ million years ago. 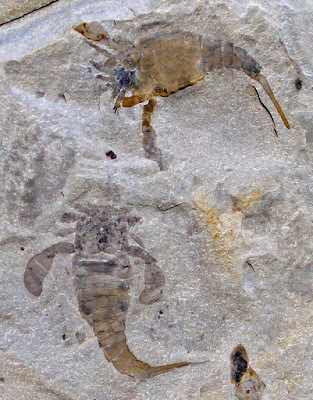 These are extinct marine arthropods, and not true scorpions. After finding a claw on his first try, he uncovered two beautiful scorpions on his second (below)! Photos courtesy Jack Share of Written in Stone. 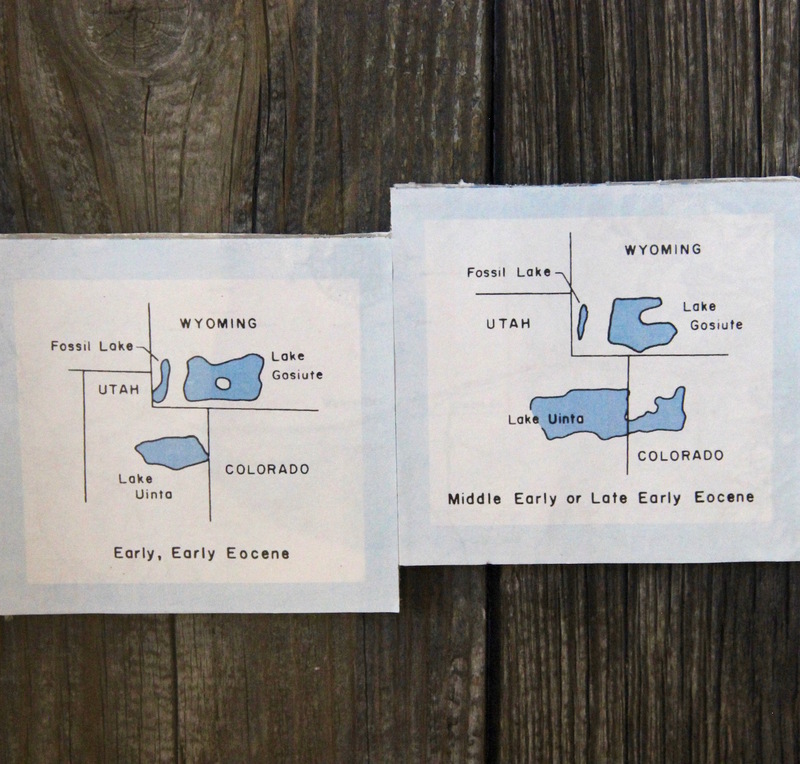 Here in Wyoming, we have a world-renown conservation lagerstätte, in the Green River Formation. It's a grand accumulation of exceptionally-preserved fossilized creatures that were buried in lake-bottom muck about fifty million years ago. Some layers are especially rich. 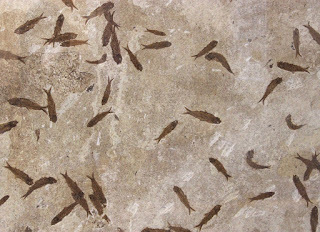 The Fossil Butte Member, just 20 m thick, has yielded millions of exquisite fossils of fish, flies, bats, snails, spiders, parrots, mosquitos, crocodiles, and (best of all) plants. Exceptional preservation requires exceptional conditions. In the case of Green River fossils, frequent floods may have deposited enough sediment on the lake bottoms to quickly bury the dead. Perhaps lake water periodically turned noxious, killing scavengers and microbes that would otherwise devour soft tissues. Whatever the causes, we’re lucky. We share the Green River Formation with adjacent states (source). Articulated skeleton of a clawed bat, in beautiful detail (NPS). Sabalites powellii, an extinct palm (NPS). Macginitiea wyomingensis, an extinct sycamore. Plant fossils are especially valuable, for they provide clues for diciphering paleo-environments. 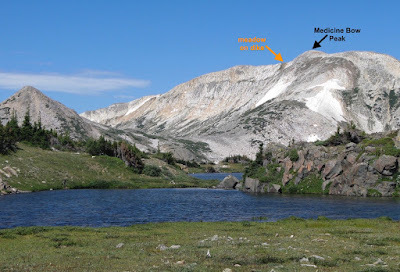 A diverse flora with palms, ferns, horsetails, sycamores, sweetgums, catalpas, lotuses and more suggests Wyoming was subtropical (or at least mild) during early Eocene times. 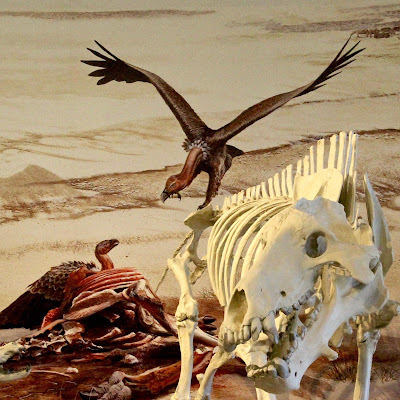 Southwest Wyoming 50 million years ago (artist’s reconstruction; Chicago Field Museum). 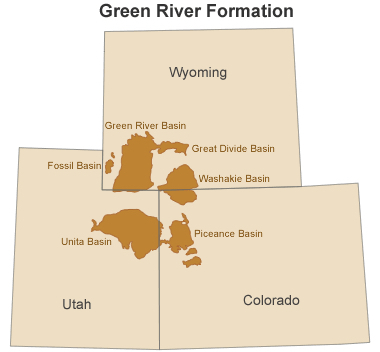 Wyoming citizens are rightly proud of the Green River Formation. It’s considered one of three great conservation lagerstätte in the world (Nudds & Selden 2008), the other two being an oil shale deposit near Darmstadt, Germany, and the Florissant Formation of Colorado. But the order may be rapidly fading. (Tearful?) 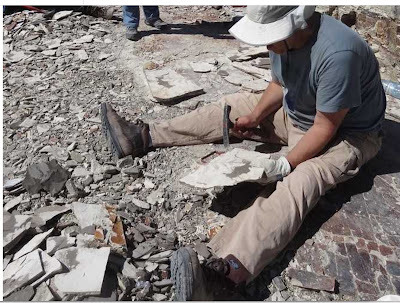 paleontologist at a Lago del Hunco quarry (source). 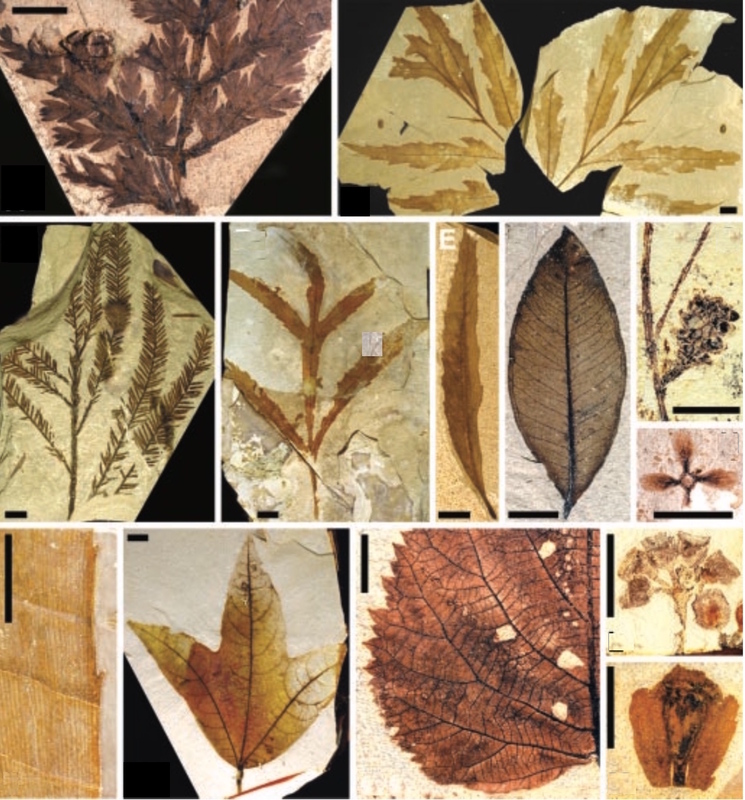 Fossils of the Lago del Hunco Formation record a time when a great diversity of plants—probably a rainforest—grew around a lake. Dead plant material that washed into the lake was frequently buried in sediments containing large amounts of volcanic ash and debris. That lake-bottom muck is now tuff containing beautiful soft-tissue fossils, and the rainforest is long gone. Paleontologists work amid dry desolate hills. 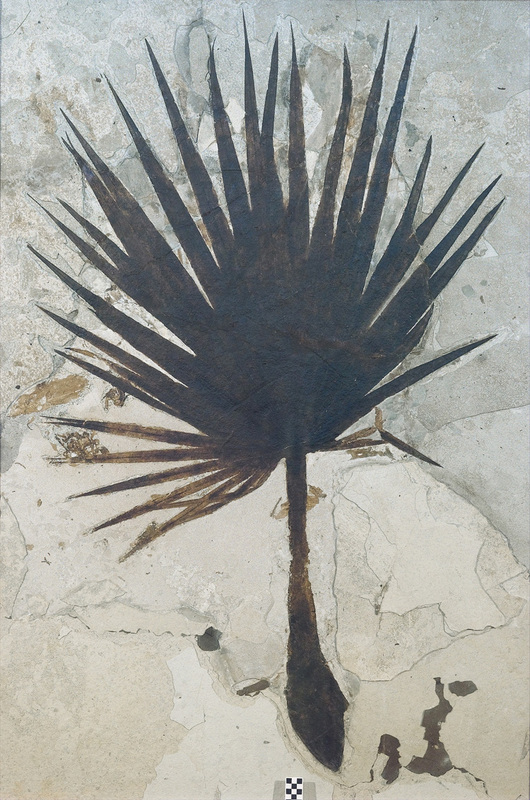 In 2003, Wilf and colleagues reported that the Lago del Hunco flora had a richness (number of species) that “exceeds that of any other Eocene leaf flora, supporting an ancient history of high plant diversity in warm areas of South America.” The known flora as of 2013 (listed here) includes ferns, cycads, ginkgos, several unidentified conifers, palms, eucalyptus trees, grasses, many members of the pea family, and more. Fossils from the Lago del Hunco Formation (Wilf et al. 2003). Scale bars are 1 cm long. Will Lago del Hunco fossils bump our Green River Formation from its standing as one of the three great conservation lagerstätte? It’s too early to say; much work remains to be done. But an especially charismatic plant appears to be making fossil numbers and quality irrelevant. In slabs of white tuff, Peter Wilf found two tomatillos. Exceptional preservation combined with the popularity of tomatillos among salsa-aficionados was enough to grab the attention of the press. “Tomatillo Fossils, 52 Million Years Old, Are Discovered in Patagonia” (The New York Times). Tomatillos are tomato relatives, with smaller green fruit. They’re distinctive for their thin papery inflated husks. To find these delicate structures preserved in rock 52 million years after death is mind-boggling! This discovery also upsets current thinking about the evolution of the Solanaceae, the family that includes potatoes, tomatoes and nightshades (discussed here and in Wilf et al. 2017). 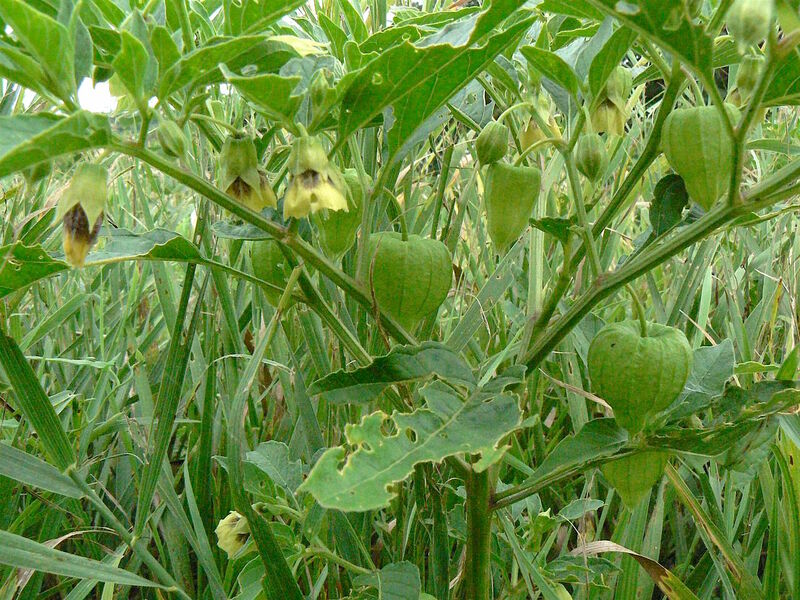 Garden tomatillo or Mexican husk tomato. The husk, or lantern fruit, is an inflated calyx (source). 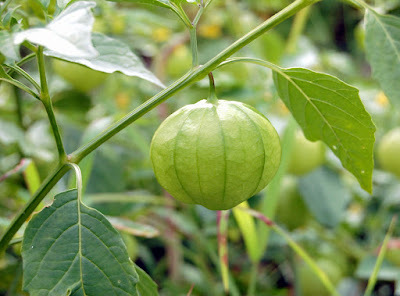 One of our wild tomatillos, Physalis heterophylla (source). “Eocene lantern fruit from Gondwanan Patagonia” (Wilf et al. 2017). I have to admit, I'm in awe of paleobotanists. I’ve done floristic surveys myself, compiling species lists for areas large and small. We collect plants in identifiable condition, with flowers or fruit, and compare them to herbarium material to verify identification. Sometimes we analyze relationships to well-documented floras elsewhere to determine affinities, and try to tease out biogeographic history and paleoclimate. This isn’t easy, even with fresh specimens, so to identify and coax stories from 52-million-year-old fossilized plants seems magical! 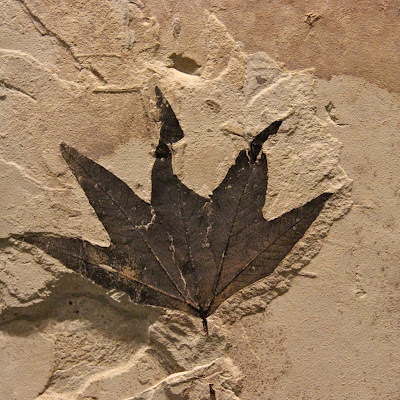 Are paleobotanists part shaman—able to bring the dead back to the land of the living? Maybe they're more like Virgil, who visited the past himself and then returned to tell he found. May I reveal what lies deep in the gloom of the Underworld! 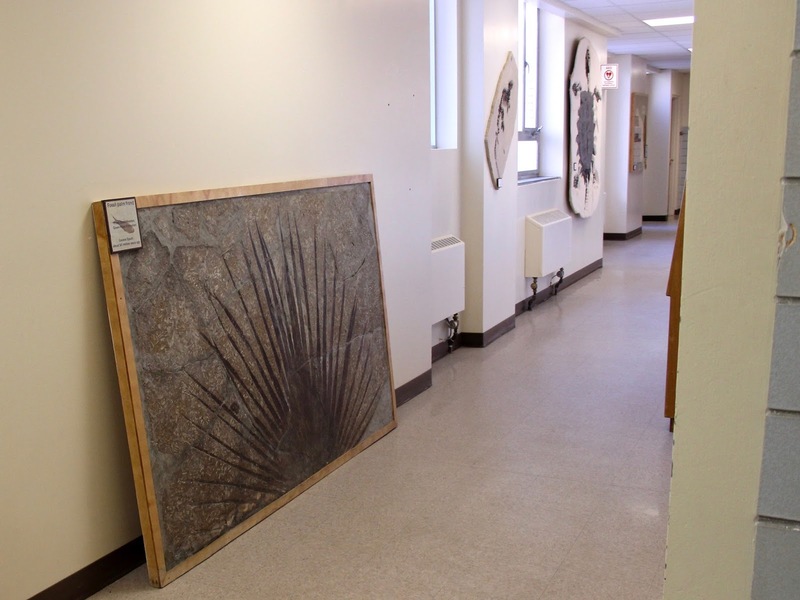 Thanks especially to Mike the rock guy, for help with paleontological issues! Cutler, A. 2003. The seashell on the mountaintop; how Nicolaus Steno solved an ancient mystery and created a science of the Earth. A Plume Book. Grande, L. 2013. The lost world of Fossil Lake. University of Chicago Press. Montanari, S. 2016. 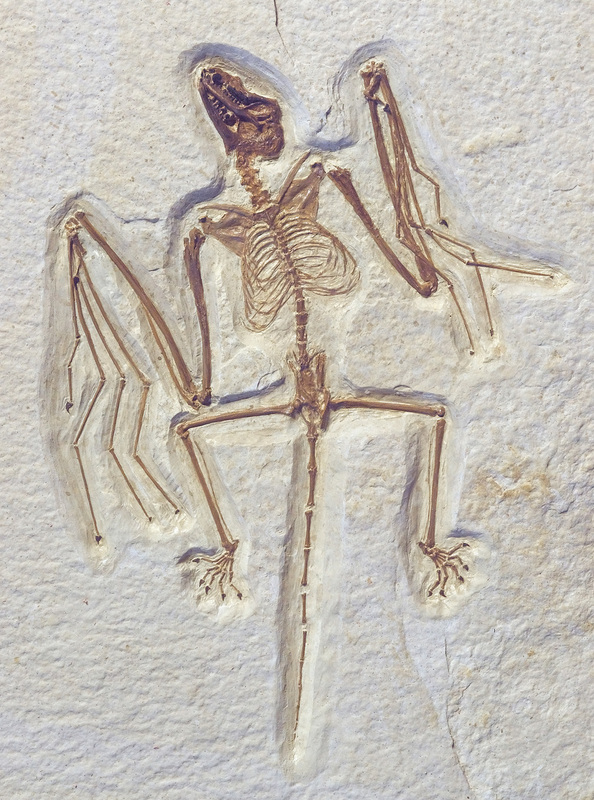 What Darwin didn’t know about the fossil record. Forbes, Feb 12, 2016. Wilf, P, et al. 2003. 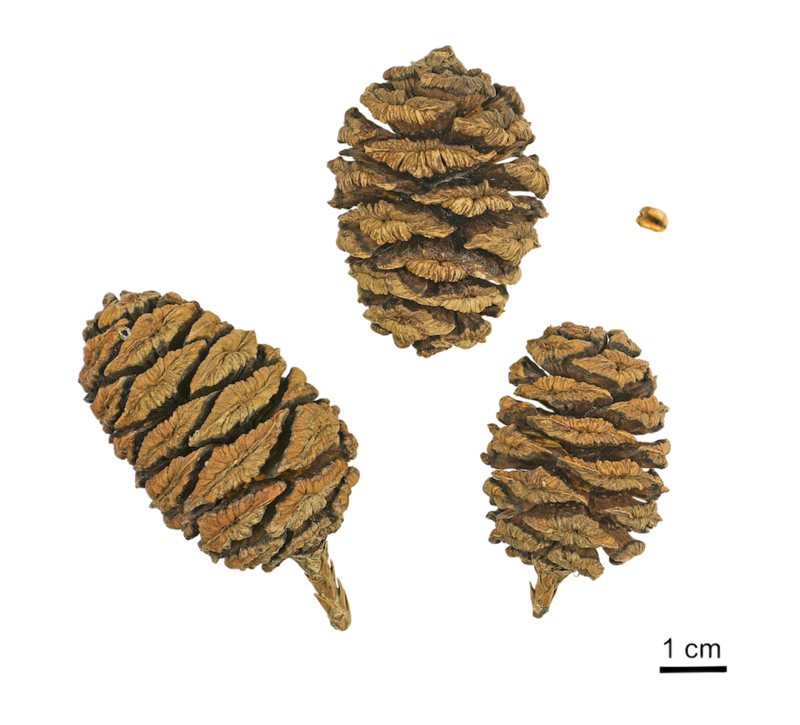 High plant diversity in Eocene South America: evidence from Patagonia. Science 300:122-125. Wilf, P, et al. 2017. 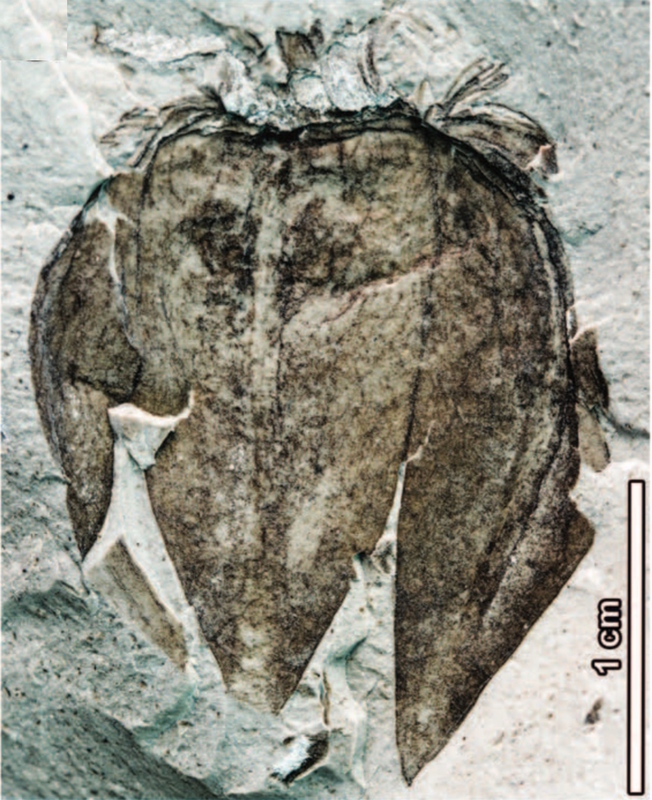 Eocene lantern fruits from Gondwanan Patagonia and the early origins of Solanaceae. Science 355:71-75. 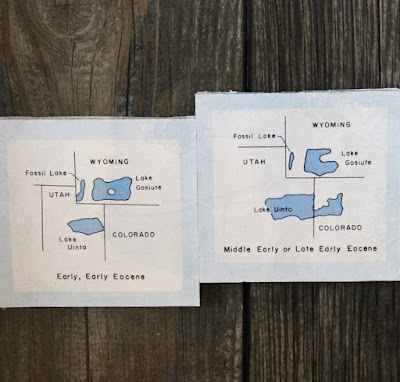 Dreaming of a subtropical Wyoming (source). The New Year is upon us, as is the January gathering of tree-followers, kindly hosted by The Squirrelbasket. 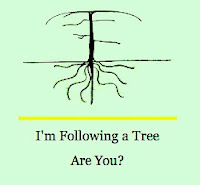 Many of us have chosen a new tree to follow. In Laramie, choosing a tree this time of year is not so easy. Our trees either lie dormant until April (willows, cottonwoods) and May (most others), or they’re evergreen conifers that don't change much through the cold season. Last month, I checked out several candidate trees in the Williams Conservatory, non-natives new to me that should show more action. But none caught my fancy. Then diversifolius of botanically inclined recommended I follow the tree I said was my favorite: “a plants-and-rocks kind of tree, specifically a plant in rock.” Duh, of course I should! So what if it’s been dead for millions of years! Sabalites powellii, a palm native to Wyoming (from the County Courthouse in Kemmerer; NPS). 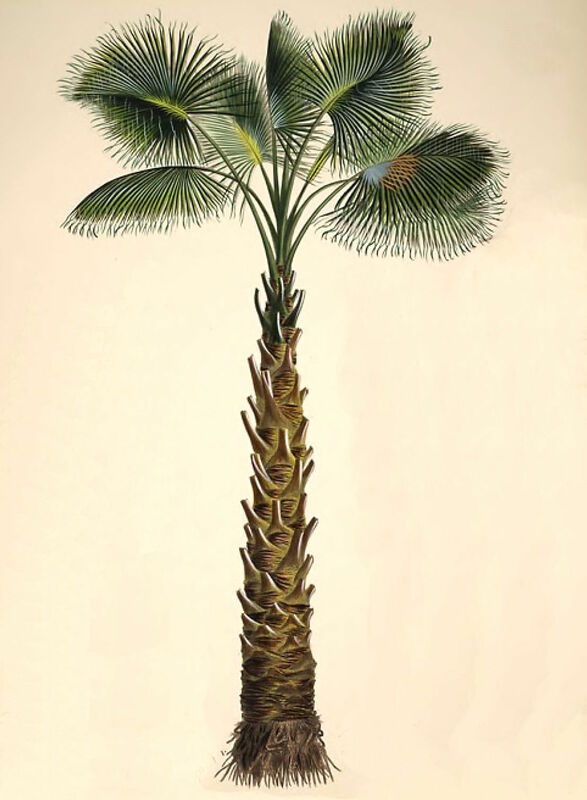 Sabalites powellii is a kind of palm tree. It has no common name so I will call it “sabalites” (roughly saa-buh-LEE-tees … as if we knew how to pronounce Latin!). 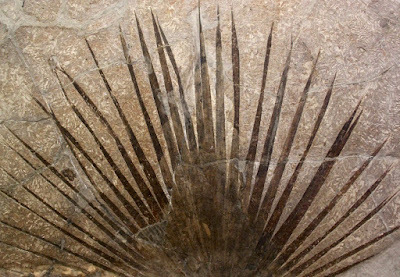 No one expects to find palms in Wyoming today, but fifty million years ago they grew in abundance on lake shores in the southwest part of the state. 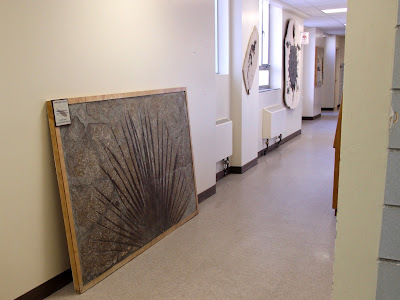 A beautiful fossilized sabalites frond stands in the hallway to the Geology Museum at the University of Wyoming. 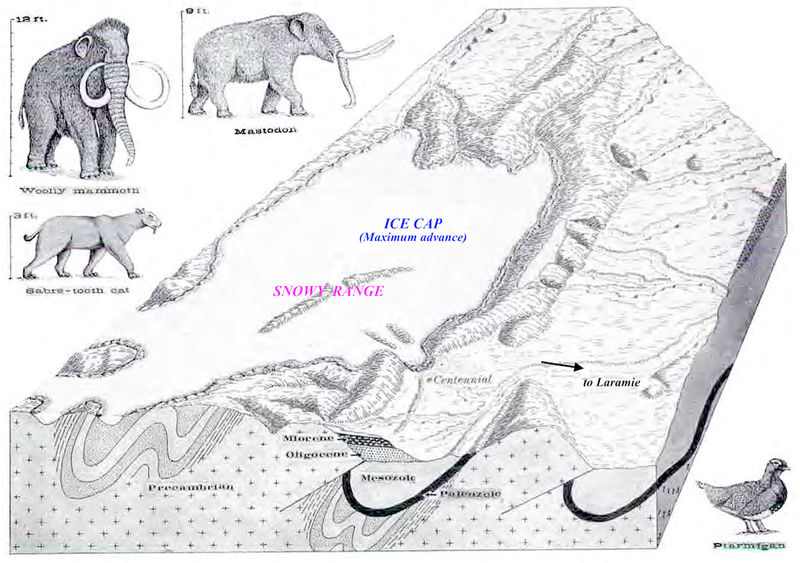 Fossil Lake was the smallest of the big Eocene lakes, but perhaps the richest in fossils. 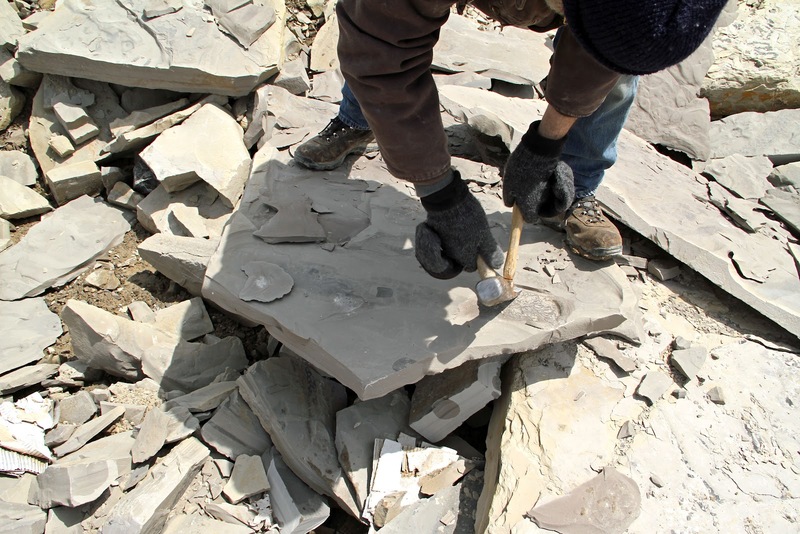 Millions of fossils have been collected from the muck that accumulated at the bottom of Fossil Lake and turned to rock (now part of the Green River Formation). Most famous is our state fossil, Knightia—a fish closely related to herring. But there’s far more, e.g. stingrays, turtles, crocodiles, parrots, grouse, ants, bees, butterflies, dragonflies, mosquitos, spiders, snails, ferns, cattails and palm trees. 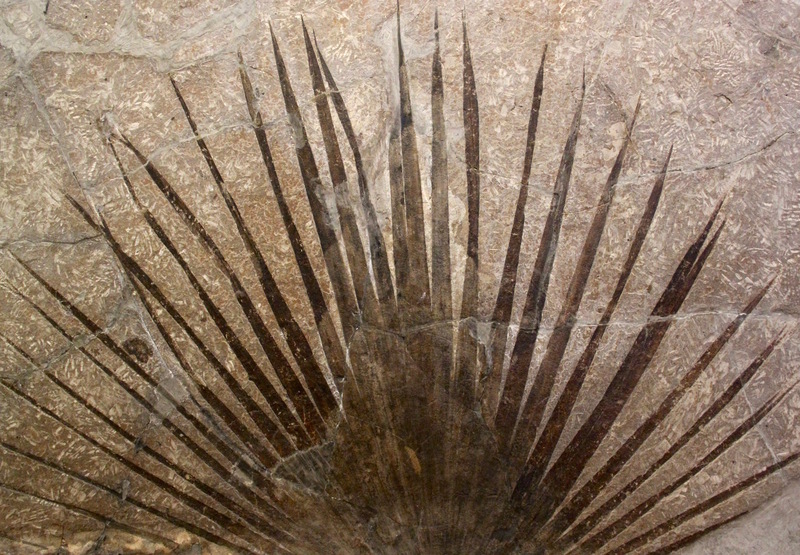 Fossilized Knightia, University of Wyoming Geology Museum. The fossils of the Green River Formation are one Wyoming’s greatest resources, and yet all these years I’ve ignored them. It’s time to make amends! However a visit to Fossil Lake will have to wait, as the climate is no longer subtropical. Wyoming winters are no longer suitable for camping, hiking, and outdoor contemplation. So I’ll go in May. Until then, there’s plenty to learn about palm trees, the Green River Formation, the environment of southwest Wyoming 50 million years ago, and fossils in general. For example, how do paleobotanists get away with naming a new species based on such poor fragmentary specimens?! We caenobotanists** could never do that. 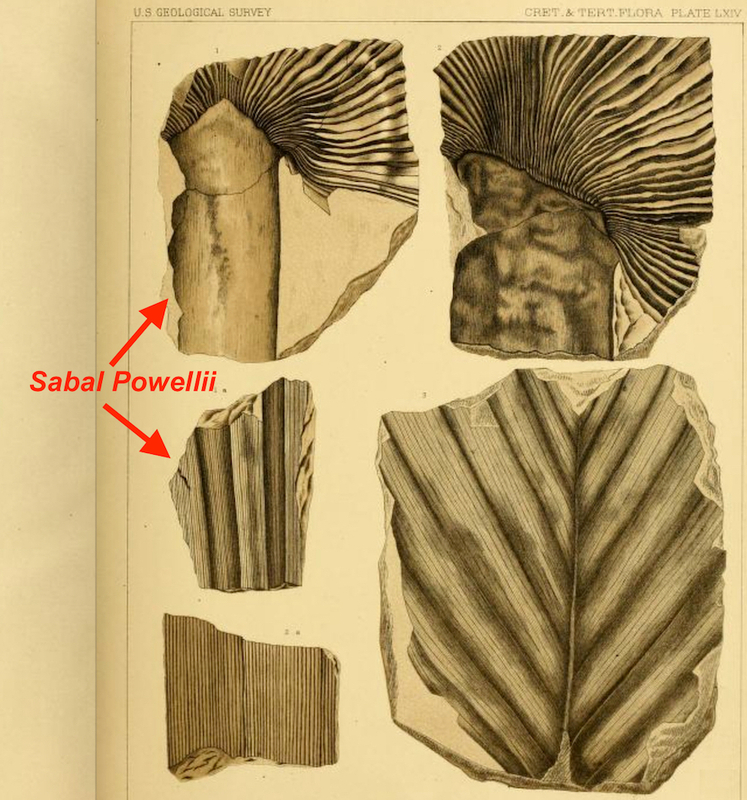 Designated type specimen for Sabalites powellii (then called Sabal Powellii), collected in the 1880s (source). My fascination with the history of scientific exploration in the American West is another reason to follow this palm. Its discovery dates from the exciting era of the great post-Civil War geological and geographic surveys. The story includes characters like geologist Ferdinand Vandeveer Hayden, infamous for self-promotion but also an effective advocate, and paleobotanist Léo Lesquereux, a most amazing adventurer who started when he was 65 and completely deaf. Now there’s a role model! 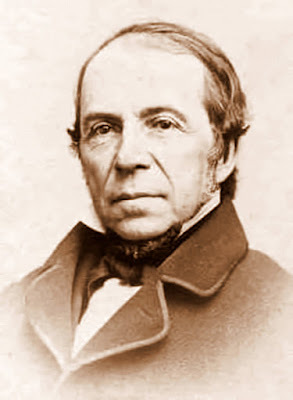 Paleobotanist Léo Lesquereux. In 1870, he joined Hayden’s expedition to the western territories (source). 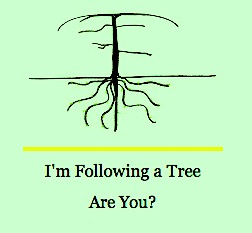 The beginning of the year is a perfect time to join us in tree-following. It’s easy, requires only as much time as you wish to give, and is always interesting. For more info, click on the links at the top of the post. ** I made up caenobotanist as I needed an antonym to paleobotanist (old botanist); caeno is Greek for new. Curiously-arranged stones say it used to be much colder, and not that long ago. Laramie winters are cold, with daily highs generally below freezing. Winds blow hard, often 30 to 40 mph, gusting to 50, 60, even 70. When arctic air masses visit, temps drop well below zero (F) and we post numbers and pictures on Facebook to show what we have to endure. But we shouldn't brag. Our local rocks and dirt tell us that Laramie weather could be much worse. Twelve thousand years ago—a mere blink of a geologic eye—an ice sheet covered North America as far south as today’s central Montana, North Dakota, and eastern South Dakota. It never reached Wyoming, but we weren’t exempt from the bitter cold. 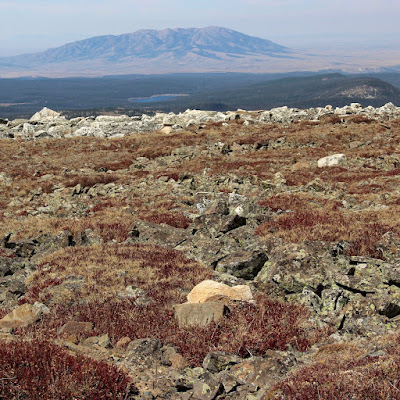 Most of our basins contained permafrost, with only the uppermost soil melting in summer. 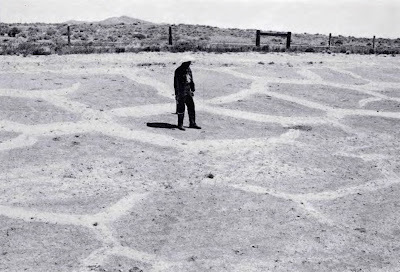 When it refroze, expansion cracked the surface, year after year, creating networks of polygons. Now they’re buried under soil, except where fortuitously revealed by disturbance. 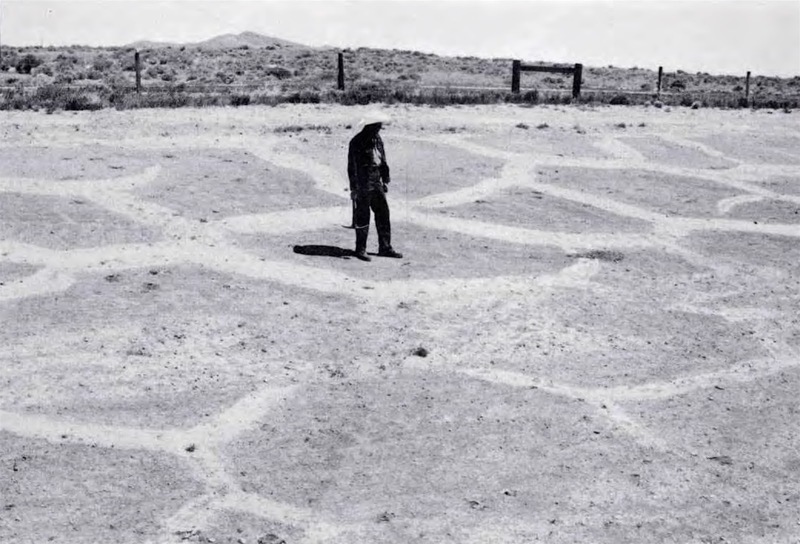 Relic frost polygons exposed during road construction at Crescent Junction, Wyoming (Mears 1987). Frost wedges (polygons in cross-section) at the Rawlins city dump (Mears 1987; arrows added). In the mountains, it was cold enough that snow survived summer melting. It accumulated, turned to ice, and began to flow, as glaciers. 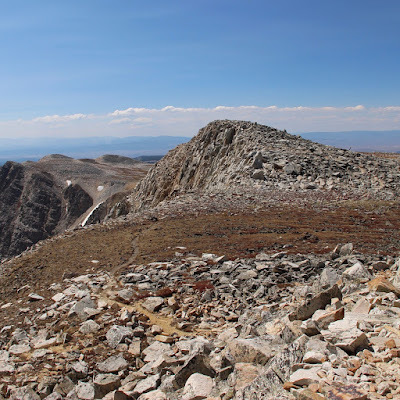 In the Medicine Bow Mountains west of Laramie, alpine glaciers merged into an ice cap across most of the crest, except for the highest part—the Snowy Range, a long steep-sided ridge of hard quartzite. Glaciers scratched and polished the rock only at the base; snow and ice didn’t accumulate above, at least not enough to form glaciers. The Snowy Range stood above the alpine ice cap (SH Knight 1990). Field assistant cavorts on the gently-rolling crest of the Medicine Bows; Snowy Range behind. 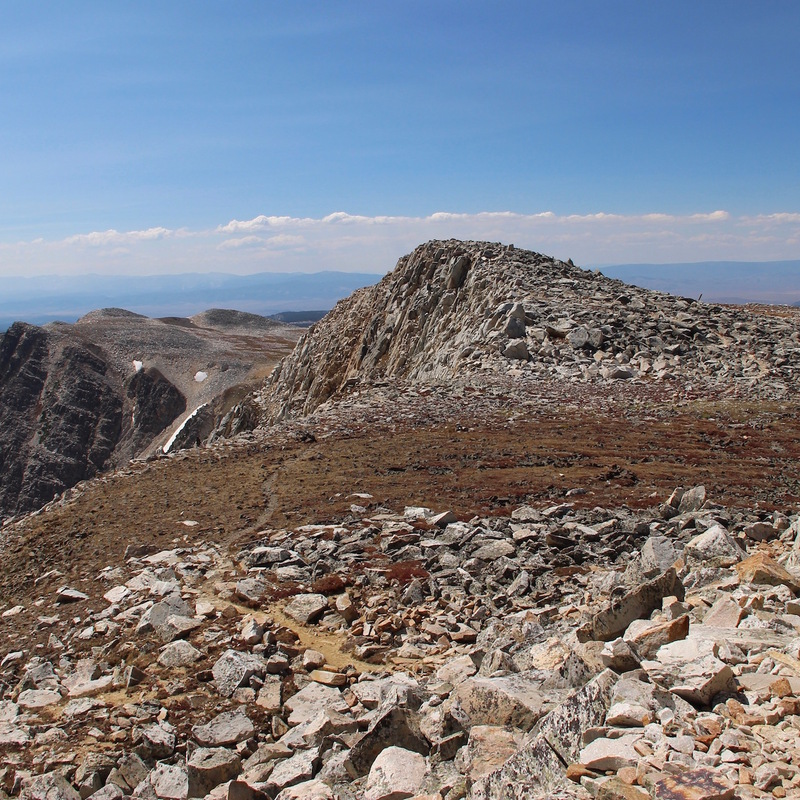 Though unglaciated, the Snowy Range was not immune to cold. Frigid conditions left their mark in other ways, most obviously the abundant felsenmeer (rock seas)—massive accumulations of boulders created by water! Bit by bit, expansion with freezing shattered solid quartzite into huge jumbled piles of angular blocks. 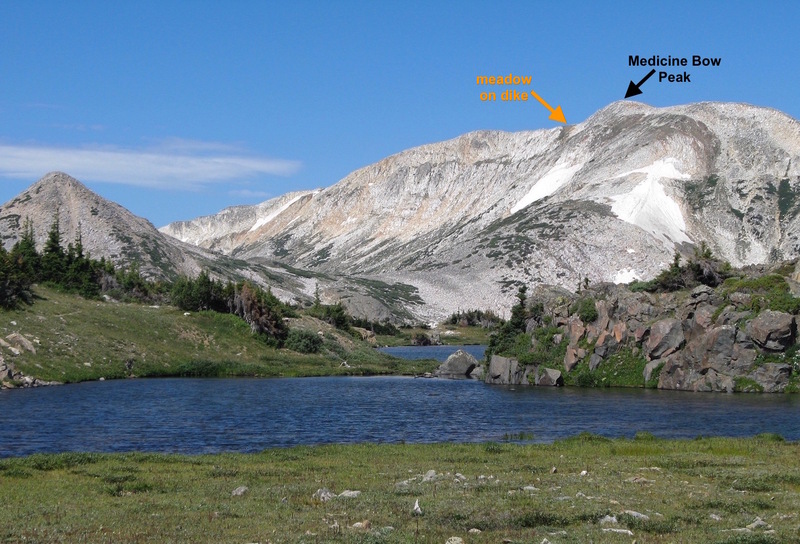 The trail to the summit of Medicine Bow Peak repeatedly crosses felsenmeer, fortunately via paths built by trail crews. The summit itself is a giant rockpile. 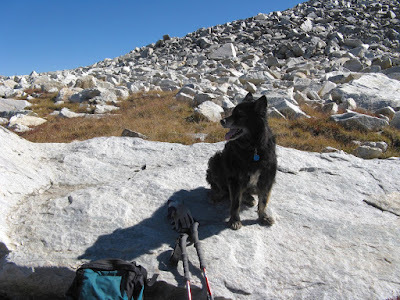 My old pal Sparky takes a break en route to Medicine Bow Peak. Final section of trail to the summit. See any patterns in the plants and rocks in the foreground? 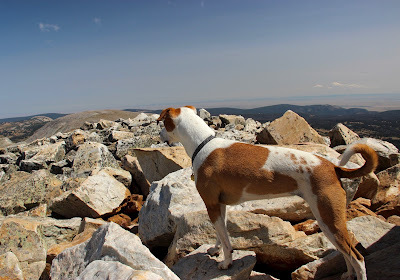 Emmie summits Medicine Bow Peak, her first ascent. 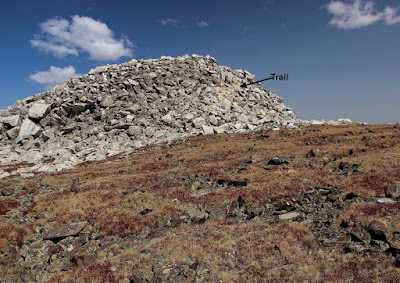 Just before the final push to the summit, the trail crosses a saddle underlain by a basalt dike (older sources call it diorite). Basalt is softer than quartzite and weathers more easily, explaining the low area with soil. 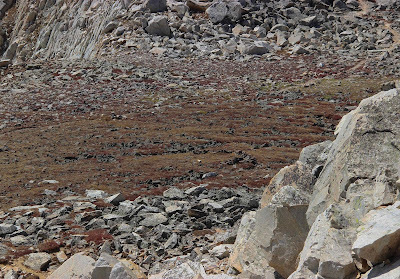 Short alpine plants form turf among lichen-covered rocks—a meadow of sorts. View of meadow from summit trail, in late August. Meadow on basalt dike; older sources call it diorite. Dike from below, near Sugarloaf trailhead. 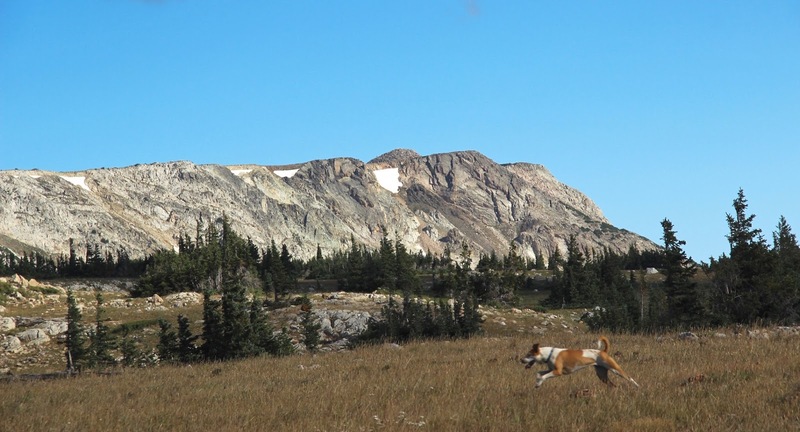 From the right perspective, one sees that rocks in the little meadow are not randomly scattered. They outline polygonal patches of vegetation. Sound familiar? Yes, these are permafrost features—stone nets. Rocks and dirt were sorted, by annual freeze-thaw. 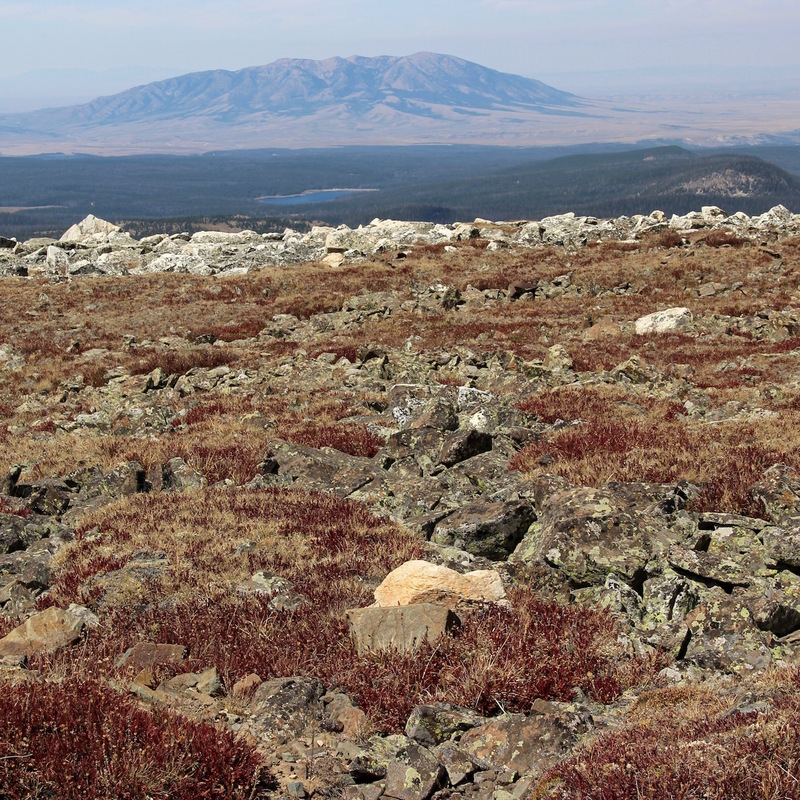 Currently, active stone nets are common in Alaska, northern Canada, and other places with permafrost. 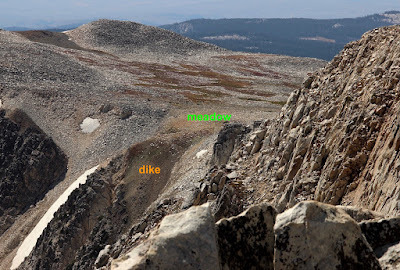 Above, stone nets seen from the trail to Medicine Bow Peak, looking south (Mears 1962). Below, roughly the same view in 2016; the nets are much harder to see. 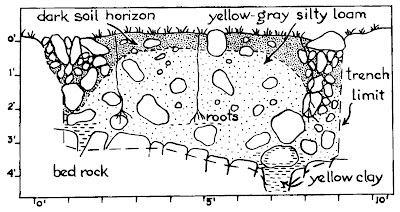 The illustrator emphasized rocks over plants, for clarity. 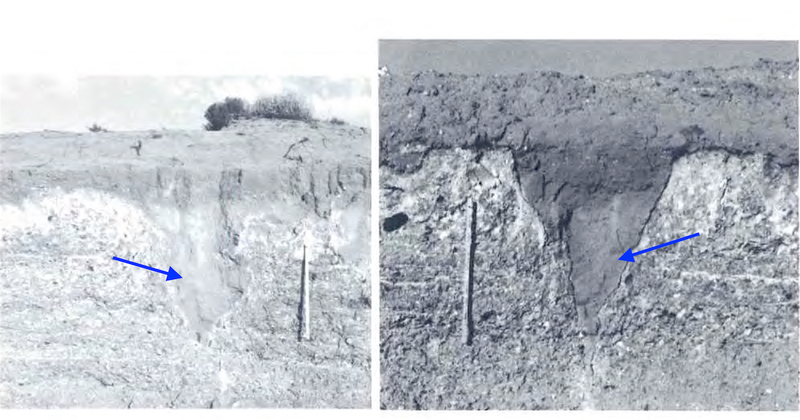 In the early 1960s, researchers dug a trench to study structural details. Larger rocks had accumulated along the sides of the polygons, with slabby ones often oriented on-edge. 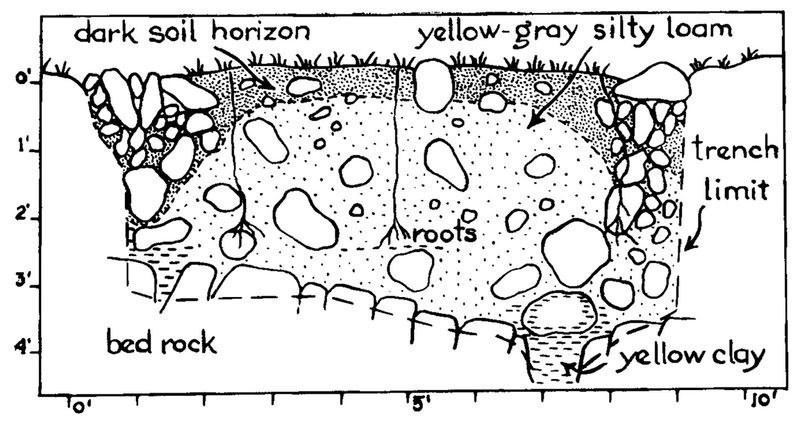 A dark (organic) layer of soil supported vegetation; plant roots extended as deep as three feet. When the study was over, they refilled the trench. These stone nets are easiest to see from the ground, looking west slightly downhill (e.g. photos below). 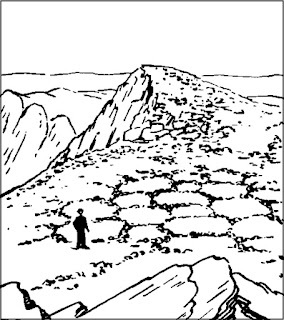 On gentle slopes, rocks have been sorted into lines that anastomosed into polygons. On steeper areas they form stripes. As far as I could tell, common plants included alpine avens, moss campion, short sedges and a nearly-prostrate alpine willow. I need to return when things are blooming! At the time of Mears’s 1962 publication, no one understood the mechanism behind frost sorting. 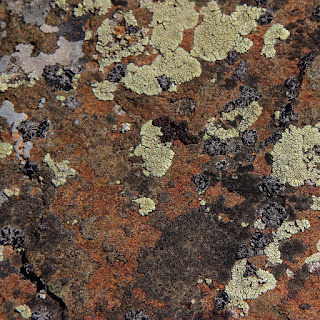 Since then, computer modeling has suggested that with severe freezing, wet rocky soil expands enough to lift larger rocks and push them aside. Finer materials remain because they flow in response to frost heaving (more details here). Sorted rocks are covered in lichen, suggesting they haven’t moved in awhile. 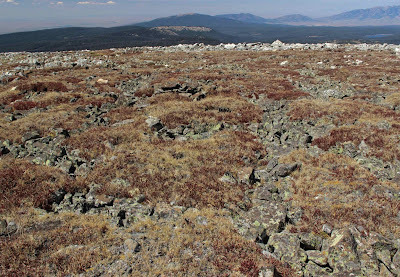 Developed soil, vegetation, long plant roots, and lichen-covered rocks indicate these stone nets are no longer active. But that could change. If another glacial episode were to override our global warming, stone nets and frost wedges would grow again. And here in Laramie, it may not have to be all that much colder! 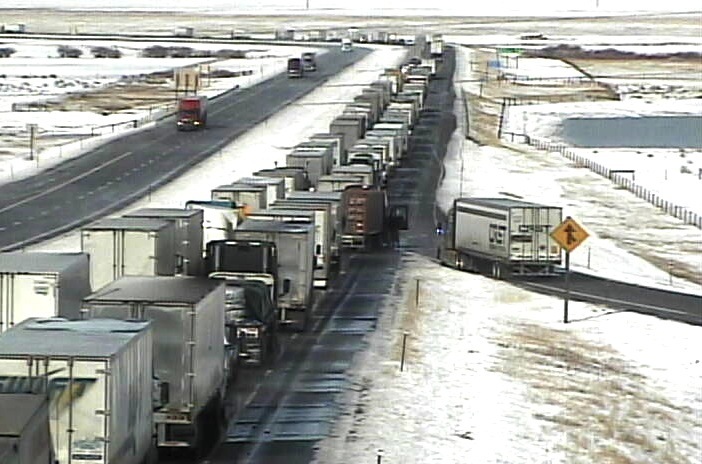 Blizzards often close I-80, filling Laramie with trucks. Would life go on if glacial times returned? Thirty-three years have passed since we lined up along a ditch to admire relic frost wedges, but the memory is still vivid. It was early October and snowing Laramie snow—horizontal with the wind. Doc Mears spoke of Pleistocene times 12,000 years ago, his strong baritone easily penetrating the howling wind, while we took notes as best we could with wet cold shivering hands. 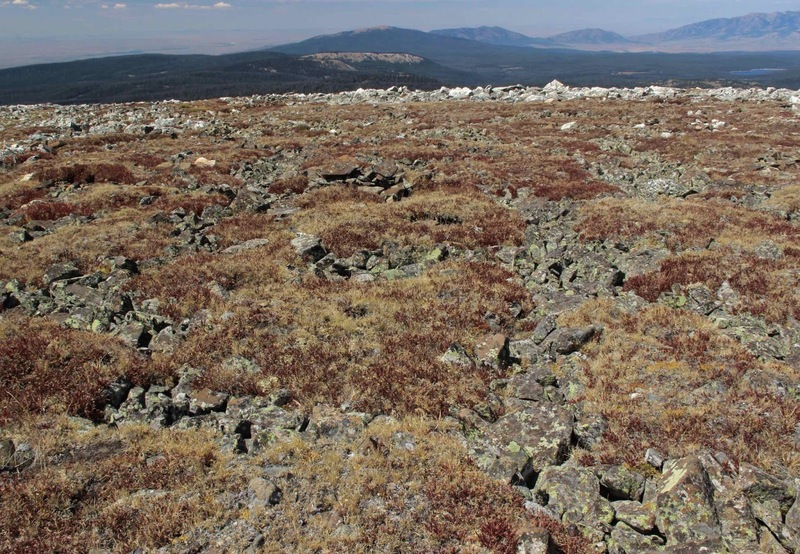 “I estimate the average annual temperature need drop just 10º C for a return to full periglacial conditions,” intoned Mears. None of us doubted it! Dr. Brainerd “Nip” Mears, Jr. at Hanna Junction, 1970. 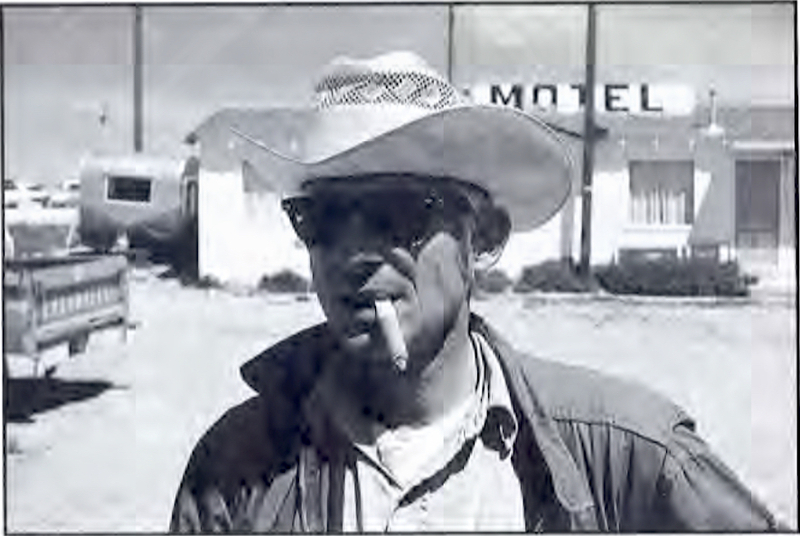 Mears’s discovery of relic ice wedges was a major contribution to our understanding of Wyoming paleoenvironments. Photo by Wayne Sutherland. Mears, B, Jr. 1962. Stone nets on Medicine Bow Peak, Wyoming. Short note, University of Wyoming Contributions to Geology (p. 48).